Life can be hard sometimes and we often carry around burdens that aren't ours. Sometimes we carry worry about our loved ones or the weight of others expectations. 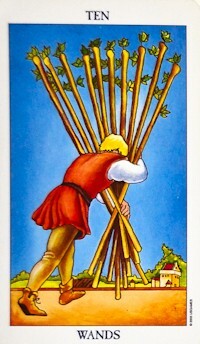 When that happens, we can start to feel like the person in the 10 of wands who is bent over from carrying all the weight of all the wands in the world. When that happens it might be time for a little tarot magic to help ease your burden. Before doing this little spell, find a time when you won't be disturbed, take the phone off the hook (or put it on silent), tell your family you need some alone time, and find a comfortable place. It can be your kitchen table, an altar, your desk, or any place that feels comfortable to you. If you want to set the mood, you can light a candle and some incense, but that's not necessary to do this spell. Grab your favorite tarot deck and get comfortable. After you've pulled your cards, hold the ten of wands in front of you and step into the person on the card. Feel the weight of the world on your shoulders, look into the distance and see the town that is so far away. Take some time to think about what you're carrying on your shoulders. I realized that all the weight I felt was the weight of everyone else's expectations: the weight of my children's need to be supported, the weight of my mother's expectations about how I lived my life, the weight of my ex-husband's thoughts about what I should or should not be doing in my life, the weight of work expectations, etc. After you've identified what you're carrying around that you're ready to release, let the wands fall off your back. Feel yourself releasing the burdens you're carrying, as they fall off your back, stand up tall and move your shoulders around. Now, pick up the court card and imagine yourself embodying this card. Feel yourself within the card as you take on the confidence of the card. Look around as if you were seeing the world from the court card's position. Feel queenly, feel kingly, feel the strong and bold energy of a knight, or feel the inquisitive energy of a page. Once you feel you are inhabiting the energy of the court card, pick up the ace and envision yourself using the energy of the card to create a bubble around you. If you are using a wand or sword, you can envision yourself drawing a circle on the ground that encompasses you and becomes an energy sphere. If you're using a pentacle, imagine sprinkling salt around yourself and creating an energy sphere. For those of you who chose water, imagine a bubble getting bigger until it surrounds you. Take a few moments to sit within your magic bubble, envisioning it's walls serving as a boundary between you and the burdens that are no longer yours. Sit within the peace and calm of your sanctuary and remind yourself that you only have to carry the burdens you choose to pick you and you can choose to put down the burdens that are not yours at any time. When you're ready to leave your sacred bubble, open your eyes and re orientate yourself to your ordinary surroundings. And the next time you are tempted to pick up someone else's burdens, remind yourself of your sacred bubble.